LONDON: Nigel Farage Meets With Julian Assange - Joe.My.God. Nigel Farage visited the Ecuadorian embassy in west London on Thursday, where WikiLeaks founder Julian Assange has been living since he claimed asylum in 2012. The former UKIP leader spent around 40 minutes in the building and left at noon, accompanied by Christian Mitchell, the head of operations at radio station LBC, where Farage hosts a regular show. Keep in mind. In a time of pervasive surveillance, sending a message personally is perhaps the most, perhaps the only secure method. 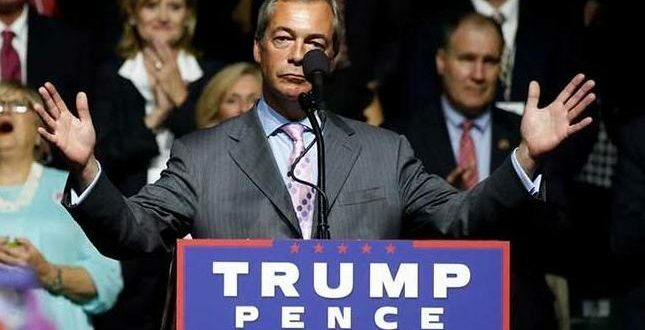 Farage was with Trump on the campaign trail. He came for the inauguration and he’s made at least one more trip to meet with Trump since the inauguration. He has been pushing to get a role as intermediary between Trump and the UK government, even though he’s never even held a seat in Parliament.